3.7 out of 5 based on 58 bloggers and 6 commenters. 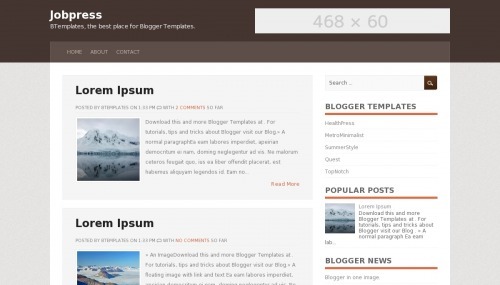 Jobpress is a free blogger template adapted from WordPress with 2 columns, right sidebar and posts thumbnails. This is what I am looking for, good for my job site. thanks. I really like this theme. I’m currently using it for my blog, which is a general allaround kind of blog. Theme fits perfectly with it as well. I like the thumbnail picture and the snippet of text from the post. Wasn’t too fond of using thumbnail pictures in my posts, but that’s changed now. this tamplet is responsive and adsense friendly?